The first of the two films is KILLER INSTINCT. While it relays the story of Mesrine’s early criminal career, it actually begins with a long, brilliantly teased-out sequence that shows the manner of his death. After that, we meet the young soldier back from his stint brutalizing Algerians while in the French army. Disillusioned upon his return to the sedate, boring home life he shares with his parents, he is drawn to a life a crime in an underworld he is soon to dominate. KILLER INSTINCT is like a cross between the young Vito scenes in GODFATHER II and (especially) GOODFELLAS. It has a very slick look to it. The outlaw life Mesrine embraces has a smooth, silky feel, even as it erupts in violence, typically at his instigation. As his portfolio of audacious crimes expands, he takes on colorful colleagues and alluring paramours and it eventually leads him to Canada and the US. 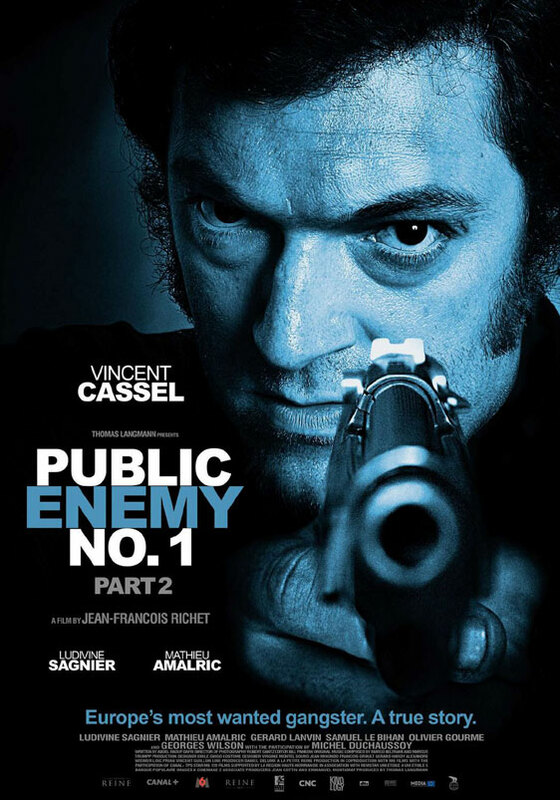 You really can’t say enough about Vincent Cassel’s performances in the films. He is completely mesmerizing. As epic as the film is, it doesn’t delve that much into the man’s character. You’re never sure what motivates him, although the Nazi occupation of France and his father’s capitulation during it, do come to surface in the first film. But, in the end, it doesn’t really matter what justification Mesrine provides, he offers several, as punctuated by close-ups at the end of many scenes, we see his principal motivation in Cassel’s stare of malevolent egotism. Honored with the French equivalent of the Oscar (denied even a nomination here) -- this is an epic, soon to be legendary, acting turn. The second film PUBLIC ENEMEY NO. 1 continues the saga, but it has a different texture to it. You’re never lost as to where you are reflecting back on the two films; they feel different. (Like the KILL BILL pictures.) And this is remarkable as the films were shot at the same time in roughly reverse chronological order to allow for Cassel’s weight loss. 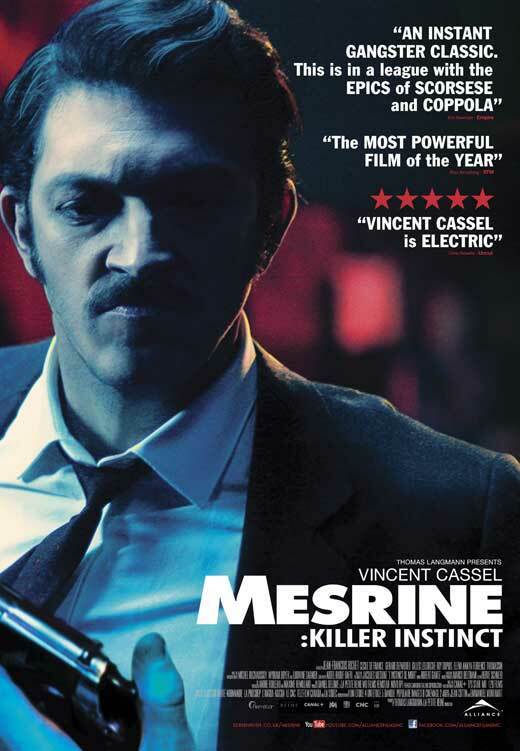 This film finds Mesrine back in France where he pulls off more bank jobs that are captured in a now kinetic and chaotic visual style. Things feel less slick than in the first film as a hairier, paunchier Mesrine goes about his criminal exercises. We watch him attempt the rhetorical calisthenics of justifying his actions against the backdrop of leftist violence prevalent throughout Europe in the 70s. It’s not that convincing – unless he’s talking about his hatred for the French prison system. As appalling as Mesrine the man is, there is something, I don’t want to say – I guess I will – admirable about his refusal to be imprisoned. These pictures have some brutal, hard-hitting (literally) scenes. The reenactment of Mesrine’s first murder (outside the army) and his treatment of his wife are likely to induce some gnawing queasiness. Also, there’s a beatdown towards the end of the second film that’s also difficult to watch. That said, I’m sorry, both these pictures are narcoticlly entertaining. I know these movies played around the country here in the U.S. when released in 2008, but for the life of me I have no idea why no one chanced releasing these in a wider distribution. If you love powerful, action – yes, commercial! -- filmmaking you will love these movies. I simply guarantee this.